I've been asked this question a lot lately, so I wrote an article on the subject. It's in my documents page at How Much HHO Should I Use?. Let me know if you still have questions on the subject. I use those questions to improve the quality of the documents. I read your document on "How much HHO should I use?" and would like to comment on your point of diminishing returns. The issue is the amount of energy required to produce the HHO, not, as I understand it, the amount produced. As I'm sure you are aware, BMW has a vehicle that runs on gasoline or hydrogen. The engine will run on straight hydrogen. Of course this automobile requires a hydrogen fuel station which last time I checked is pretty hard to find. The solution to on board HHO production is reducing the current draw. A few inventors have done this by using the capacitive nature of the HHO cell to reduce the "on" time of the current therefore reducing current consumption. The HHO production rate is said to remain constant. Other concepts induce a frequency in conjunction with the current to enhance bubble displacement from the plates and have made claims of 400% to 700% increase in the output of the cell. See Stanley Meyers or Bob Boyce. We are currently researching these claims and are in the process of building boards to produce this effect and will keep you posted. mike Wrote: I've been asked this question a lot lately, so I wrote an article on the subject. It's in my documents page at How Much HHO Should I Use?. I see your point but consider this, the difference is on board production of HHO, which can be separated into pure hydrogen and oxygen vs on-board hydrogen storage. I may be over simplifying, but the main challenge may be in getting enough mV from the EFFIE to over come the extra O2 and continue to lean out the gasoline mixture and stay on closed loop. I guess it depends on the mV range of O2 sensors and timing. It's still the same engine in the BMW and it runs on either fuel. And then there is Stanley Meyer's dune buggy. I agree. We will beyond an EFIE when we progress to that point. ECU tuning will be required. The ECU in my Infiniti, for instance, allows me to adjust several parameters of the O2 sensor system. Here's a screen shot of some of the parameters I can alter/tune. The values below are the stock settings, I have not started tweaking these yet. I plan to tune for HHO first with and EFIE as most people don't have these options like I do and I'd like to achieve results others can duplicate. Once I verify possible gains with an EFIE then I'll see what I can achieve tuning the ECU. I also already have an aftermarket wideband in this car. The screenshot is from Tunerpro. It is fairly involved to get to this point. I have been tuning this car for performance for a while now. It has been extensively upgraded, turbo charged, etc. This method is far from a "plug and play" system. ECU's stock EPROM was removed and a ZIF socket installed in it's place. This allows you to swap out EPROMS easily. You have to have an XDF (address) file for your particular vehicles ECU that works with Tunerpro. I downloaded the stock BIN file (program) from the stock ECU and Tunerpro lets you read and edit the BIN file using the XDF file. The XDF file tells Tunerpro which hex addresses are what otherwise you are just looking at a bunch of hex code...worthless. I burn the edited BIN file to a rewritable EPROM chip and plug it into the new ZIF socket in the ECU. There are a few vehicles this method will work with but I only really know now to do early 90's Nissan/Infiniti Products. For my vehicle I also use a "Consult" cable which is Nissan's OBDI interface. This allows me to view many parameters of the vehicle and diagnose issues. I can datalog, reset codes, view mileage figures etc. If you have an early 90's Nissan product or just want to read much more detail on what I've done read this link. Fairly long but it's great information on tuning your own ECU. I'm sure much of the info will cross over to other auto makers. I've tried to figure out how to do this on my Toyota but they use a completely different ECU and it's not possible. Considering picking up an early 90's Nissan truck, Sentra or something that I can tune. RICH is high mV value LEAN is low mV value. Therefore EFFIE adds mV to simulate RICH value, correct? qsiguy Wrote: I agree. We will beyond an EFIE when we progress to that point. ECU tuning will be required. The ECU in my Infiniti, for instance, allows me to adjust several parameters of the O2 sensor system. Here's a screen shot of some of the parameters I can alter/tune. The values below are the stock settings, I have not started tweaking these yet. I plan to tune for HHO first with and EFIE as most people don't have these options like I do and I'd like to achieve results others can duplicate. Once I verify possible gains with an EFIE then I'll see what I can achieve tuning the ECU. I also already have an aftermarket wideband in this car. Well, your first sentence contradicts itself I think but the last sentence is correct. O2 value and mV values are both talking about the O2 sensor reading. Not sure what you mean I guess. 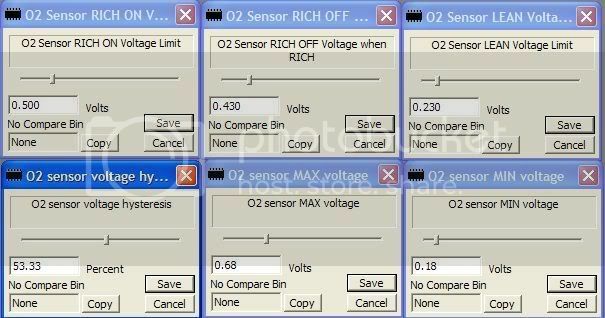 The mV signal generated by the O2 sensor is predicated on the ratio of O2 vs other exhaust gases. High O2 vs other gases is LEAN, low O2 vs other gases is RICH. Right?